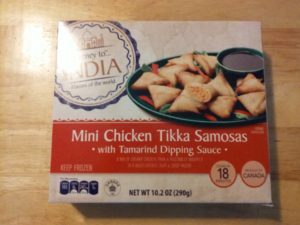 EDITOR’S NOTE: This post contains a rundown of Aldi Special Buy Indian food. You can find brief takes on some of their Regular Buy items here. Keep in mind that Aldi sometimes shifts food from one category to another, so what is a Regular Buy might become a Special Buy, or vice versa. Also, some Regular Buys are regional, so what is a Regular Buy in one area may be a seasonal Special Buy in another. Aldi has a pretty large lineup of Regular Buy Indian products, but they sometimes also roll out Special Buys from time to time. One note — taken from our first Indian post — before we begin: at the store, another woman who was shopping asked an employee if the Indian entrees in the freezer were very spicy. I couldn’t help chiming in and mentioned most Indian food I buy from grocery stores isn’t too spicy. At most, it has a little kick. Restaurant food tends to be much more spicy, depending on the chef. After having sampled those foods from Aldi now, I can say that nothing is overly spicy, except the Special Buy Specially Selected Jalfrezi Curry Sauce. So, on to the Special Buys. 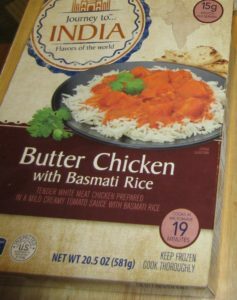 The Journey to India Butter Chicken with Basmati Rice is a Special Buy frozen entree that I have never seen before at Aldi. It was sold in a box in the freezer section, and it consists of white meat chicken in a “mild creamy tomato sauce” with basmati rice. It can be prepared in the microwave (the preferred method) or in the oven. It was the better of the two frozen entrees I tried. It had a mild spicy flavor, but it wasn’t loaded with much flavor overall. I was disappointed. The Journey to India Chicken Tikka Masala was also a new-to-me Special Buy frozen entree sold in the freezer section. It consists of white meat chicken in a “bold tomato sauce simmered with tandoori spices” and basmati rice. Similar to the butter chicken, the tikka masala can be prepared in the microwave (preferred) or in the oven. I baked both dishes for 35 minutes at 400 degrees. This was the worst tikka masala I’ve ever tasted. The dish didn’t taste anything like tikka masala. It had no spice and very little flavor; just a bland chicken and rice mixture. It definitely did not live up to the “bold” label on its box. It takes five to six minutes to steam the meal in the bag in your microwave (which the package lists as the preferred method), or you can cook it on your stove top. The meat-like product in the meal is comprised of soy protein concentrate and is a decent imitation of chicken. The bulk of the rest of the meal includes rice, cubed potatoes, and red and green peppers. This dish had a little more spice than the Chicken Tikka Masala and the Butter Chicken, and it tasted more authentic, but we didn’t like it enough to want to purchase it again. This sauce is a Special Buy that comes in a jar, and fastened on top of the jar is a small plastic container of spices. To prepare, cook a small amount of diced meat or vegetables of your choice (I used one large chicken breasts, or two smaller ones) in a tablespoon of oil until browned. Sprinkle the contents of the spice cap onto the meat or vegetables and continue to stir fry for 1 to 2 minutes. Add the sauce and continue to simmer until the meat or vegetables are cooked through. 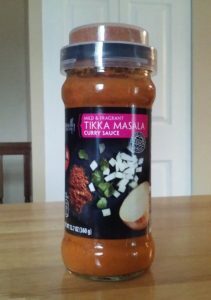 This sauce tasted fine and was not spicy, but it wasn’t the most memorable Tikka Masala we’ve tasted. 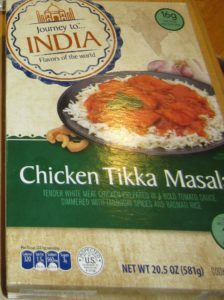 Aldi’s other Tikka Masala, the Journey to India Chicken Tikka Masala Simmer Sauce, is still the hands-down winner in my family’s opinion. This sauce is a Special Buy that comes in a jar, and on top of the jar is a small plastic cap full of spices. This sauce advertises that it is hot and spicy, and this is very much true. It was too spicy for my daughters’ tastes. 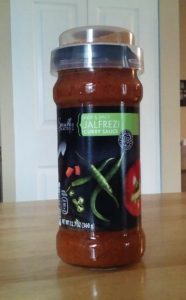 I don’t have much experience with Jalfrezi sauce, so I cannot accurately judge authenticity, but my family liked Aldi’s other Jalfrezi sauce, the Journey to India Jalfrezi Simmer Sauce, much better because it wasn’t overly spicy. This sauce is another Special Buy that comes in a jar, and on top of the jar is a small plastic cap full of spices. Of all the Specially Selected curry sauces, the Dopiaza was the best. It was actually quite good. 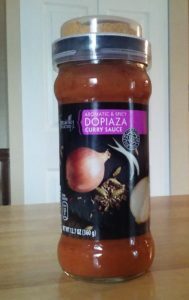 I have not eaten Dopiaza before, so I can’t compare it to other brands, but this sauce had just the right amount of spiciness (not too much) and included some nice bits of sliced onion that made it taste more substantial. The Dopiaza tasted even better when I ate the leftovers for lunch the next day. 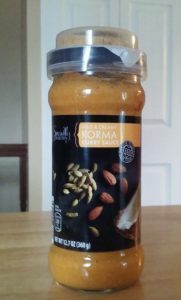 The Korma sauce had good flavor, with a classic sweet taste I often associate with Korma. My only complaint about this sauce was that it was very pasty and thick. If I make it again, I might add a little water to improve the consistency. More likely, I will stick with buying Aldi’s other Korma sauce, the Journey to India Korma Simmer Sauce, because it is the superior sauce. This occasional Special Buy comes with 12 small samosas as well as Tamarind Dipping Sauce. The instructions come only with baking instructions; there are no microwave or deep fry options. They call for baking the samosas for 18-20 minutes at 400 degrees, turning them halfway. (You may want to spray a bit of cooking spray on your baking sheet, as a couple of ours got stuck.) The dipping sauce packet is warmed by placing it in a cup of hot water for 2-3 minutes. These aren’t large, but they’re tasty, and they’re a better impersonation of restaurant samosas than we expected. They are about medium-low in the spice category: less spicy than some store-bought (and restaurant) samosas we’ve had, but spicier than mild. The Tamarind is solid, too. Just be sure to buy more than one box if you’re planning to feed them to more than a few people. Like the Journey to India Mini Vegetable Samosas, these come 12 to a box. Also like the Vegetable Samosas, they are cooked for 400 degrees for 18-20 minutes, turning halfway, and some of these also got a little stuck like their vegetable cousins. The Tamarind Dipping Sauce is prepared the same way as well. We didn’t like these quite as well as the Vegetable Samosas, mostly because the chicken tasted a little dry. They had about the same amount of spice as the veggie ones, though, and the Tamarind is just as good as the stuff in the Vegetable box. In our experience, the Regular Buy Aldi sauces are the best, although some of the Special Buys are okay. The Specially Selected Dopiaza Curry Sauce is probably the best of the Special Buy lot, while other Special Buy jarred curry sauces such as Specially Selected Jalfrezi Curry Sauce, Specially Selected Tikka Masala Curry Sauce, and Specially Selected Korma Curry Sauce are okay but not as good. We also think that, for the most part, the frozen food is inferior to the rest of the Aldi Indian lineup. 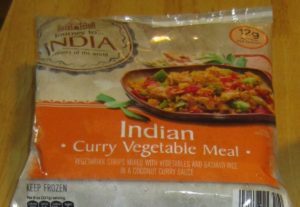 The frozen Aldi Indian meals — all of which are Special Buys — are forgettable, and at least one of them — the frozen entree tikka masala — was absolutely terrible (read: bland). If you shop for Indian at Aldi, we recommend staying away from the freezer. 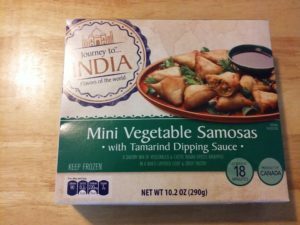 The one exception are the samosas: we liked the Journey to India Mini Vegetable Samosas and thought the Journey to India Mini Chicken Tikka Samosas were okay, if not great … and we wish both came with more to a box, so be sure to stock up if you buy them. I tried the Journey To India Butter Chicken and I’m hooked. Sent my co-worker to buy some for me and only one dinner was left in the store. Aldi’s in Edgewood, MD please re-stock this item if possible. Weekly I walked past this item and decided not to buy it, I wished I had tried it sooner. I bought the last one and now I’m on the prowl. Constantly coming in to see if it’s in the freezer section. I told my co-worker, if you don’t see the Butter Chicken, buy any of them that you find. Only one was in the store, and I was happy to get that one. My customers see me often at Aldi’s, and always ask, “what are you doing here?” Looking for that Butter Chicken. It put a smile on my face that night after a long day’s work. Thank you, sincerely. Until recently the specially selected range of hot curry sauces were our preferred choice but something changed about a month ago and now in my opinion they lack in spicy flavour and instead are far too hot to eat with enjoyment, we tried the mild range thinking that if the hot were now too hot, then the mild may be ok, not to our liking so we now go elsewhere. Of course we were hoping that it was may be a bad batch, but you have to possibly waste your time and money to find out , so now staying with a recognised brand, which this time was cheaper. Aldi is known to either tweak their formulas or change their suppliers — even while keeping the same label or packaging — so it’s quite possible that happened in this case. I would encourage you to contact Aldi on their website and let them know your opinion: in our experience they do listen, and it may get them to change back to the old formula / supplier.